A convincing victory stabilises a changing competitive scene. Only a year ago, before Blizzard introduced its region-lock for WCS, we had a non-Korean at the WCS Global Finals. David ‘Lilbow’ Moschetto qualified for the main event of the year after an impressive run of results in the WCS Circuit. The other 15 players were from Korea. Lilbow’s tournament run lasted for about 30 minutes, as he was swiftly escorted out by then-reigning World Champion Lee ‘Life’ Seung Hyun. When Blizzard announced that eight players from the WCS Circuit would automatically qualify for the Global Finals in 2016, many thought the quality of play would suffer—but this was not the case. The level in the international scene has risen significantly, and after Alex ‘Neeblet’ Sunderhaft’s KeSPA Cup victory, fans were in surprisingly good spirit about the foreigners’ chances at the Global Finals. And they did come out swinging. Tobias ‘ShoWTimE’ Sieber, Mikołaj ‘Elazer’ Ogonowski and Neeblet all advanced to the quarterfinals, where, thanks to luck of the draw, one of them was even guaranteed a Semifinals appearance. They left in the dust champions such as Kang ‘Solar’ Min Soo and Baek ‘Dear’ Dong Jun. Unfortunately, their luck ended there. Elazer came out ahead against ShoWTimE, but KeSPA Cup Champion Neeblet was unceremoniously swept aside by Park ‘Dark’ Ryung Woo in three very quick, very one-sided games. What TotalBiscuit teased as "perhaps the most exciting match in StarCraft II history" was not to be that. As a killer might develop a sort of indifference towards his victims, so Dark had little regard for foreign hopes. Having already begun the dirty work with Neeblet, he moved on to Elazer. That’s where the Polish player's story came to an end, as Dark didn’t give him a chance to put a map win on the board either. Regardless, the international players put in a shift that was massively improved from all their ill-fated attempts in previous years. Johan ‘NaNiwa’ Lucchesi’s single map win in a 3-1 defeat to Soulkey in 2013—the previously best performance of a foreigner at BlizzCon since the introduction of WCS—was vastly outperformed. This provides an encouraging look forward at professional StarCraft II in 2017. Trace the career of StarCraft II's champion in this article about ByuN, written after his GSL victory. sOs, Life, sOs. A Protoss and a Zerg had won the WCS Global Finals before the 2016 edition, and with only two Terrans in the Top 16 of this year, there could well have been another victory for aliens, even though ‘ByuN’ Hyun Woo and Jun ‘TY’ Tae Yang were considered two of the strongest players in the field. The two were drawn against one another in the Quarterfinals and produced a fantastic mirror match. ByuN went on to defeat Kim ‘Stats’ Dae Yob and Dark, securing the first BlizzCon title for his race. Terran title favorites like INnoVation, TaeJa or Maru had all disappointed in previous years. The aftermath of the meltdown in Korea, with Proleague being discontinued and several teams disbanding, was hardly felt at BlizzCon. Perhaps that was due to casters and analysts hardly mentioning it, perhaps it was thanks to players still seeing out their contracts until the end of November, and thus still wearing their uniforms. But they were no longer living in their respective teams’ houses. Champions without team houses were a rare sight before ByuN won the GSL in Season 2. Yun ‘TaeJa’ Young Seo was notorious for practicing from home, despite being employed by Team Liquid, but he also famously never won a Korean tournament. With ByuN and Neeblet, both long-time teamless players, picking up championships in Korea, and the traditional team structure perhaps becoming less sustainable by the minute, a new era may have begun. Although ByuN has now found a new team, it does not provide the same all-inclusive housing with practice partners that a team like SK Telecom T1 did for their players. Neeblet is supported by a personal sponsor, TING. ByuN’s Global Finals victory was yet another huge hint that the era of large companies employing multiple StarCraft II players, and putting them in a house together, may be over. 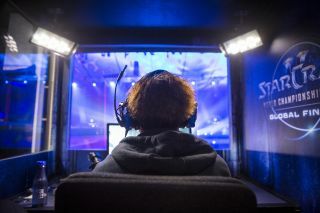 ByuN’s victory in Season 2 of the GSL, as well as now BlizzCon, has reinforced a new belief that the semi-solitary player can, in fact, function in the scene and may not be as disadvantaged as we all previously thought. Despite the Global Finals supposedly crowning the best StarCraft II player in the world, there has always been some doubt about whether it actually does. We had multiple champions in 2013, but not many thought that Kim ‘sOs’ Yoo Jin would emerge victorious at BlizzCon. In fact, most of his games at the event were not even broadcast on the main stream, until he suddenly appeared in the Grand Finals and demolished Lee ‘Jaedong’ Jae Dong. 2014 was the year of Joo ‘Zest’ Sung Wook, but Life hit form right as the Global Finals came around, after having achieved little in comparison all year. sOs would not even have qualified for the Global Finals in 2015, had it not been for Zest forfeiting his spot at an MSI tournament. sOs won the tournament and his good form took him all the way to the BlizzCon trophy again. This year was not like that. ByuN is legitimately the best StarCraft II player in the world right now. He was a strong contender to win championships all year, and did so in the GSL in Season 2. He cemented his claim to that title with the Global Championship and will be very hard to remove from that pole position anytime soon. The manner in which he beat Dark, who had only dropped a single map until then, in the Grand Finals of BlizzCon should serve as enough justification. If you haven’t yet—watch the VOD.